Loading a concrete mixing plant with the LH 40 M Industry Litronic. With the LH 40 M Industry material handler, Liebherr presented a top performer in its class at ConExpo 2017. The LH 40 is available both with a wheeled and a crawler undercarriage and provides maximum handling capacity and low fuel consumption. The machine at ConExpo 2017 was equipped with a straight boom measuring 28 ft. 3 in. (8.6 m), a 19 ft. 8 in. (6 m) long stick with angled stick-end and a Liebherr four tine grapple, type GM 69 semi-closed tines with a capacity of 1.44 cu. yds. (1.1 cu m). Other elements of the machine configuration are the hydraulic cab elevation as well as 4-point outriggers. The diesel engine of the Liebherr LH 40 material handler is a 4-cylinder in-line engine from Liebherr, which complies with Tier IV4f / Stage IV emission regulations and develops 208 hp (155 kW) (SAE J1349). The increase in engine output in comparison to the previous generation from 188 hp (140 kW ) to 208 hp (155 kW) means that the system has more torque available for more powerful movements. Furthermore, load peaks are compensated intelligently, meaning maximum torque is available at all times for maximum handling capacity. In combination with the separate hydraulic pump in the closed slewing circuit, maximum acceleration and speed for the working movements are guaranteed, according to the manufacturer. The LH 40 combines intelligent electronics with sensitive hydraulics and ensures precise and finely-controlled work with fast and powerful movements at the same time. The machine control provides optimal adjustment of the hydraulics to the respective use. Speed and power are available whenever they are needed. Liebherr relies on modern engine technology with intelligent machine controls that optimize the interplay of the drive components in terms of their degree of efficiency. Liebherr-Power Efficiency (LPE) enables machine operation in the area of the lowest specific fuel use for less consumption and greater efficiency while maintaining maximum performance, according to the manufacturer. 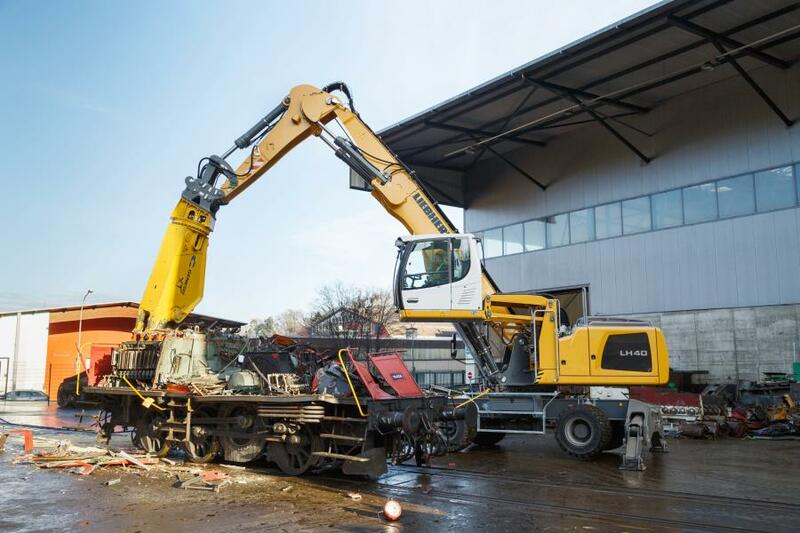 Equipped with the standard Liebherr-Energy Recovery System (ERC) the machine has a total system performance 295 hp (220 kW). The system not only brings a measureable increase in performance and higher handling capacity, but it also generates fuel savings of up to 30 percent, lower operating costs and reduced air pollution and noise emissions. The operator's cab of the new LH 40 material handler offers the best conditions for healthy and productive work. The cab was further improved in terms of ergonomics, operating comfort and functionality. The foldable left armrest allows easy and safe entry to the cab. Smooth and precise operation of the machine is performed through the ergonomic joystick which comes with an outrigger control function as standard. This fact and the standard joystick steering give operators an additional comfort boost. Steering movements can be conveniently performed using the joystick, eliminating the need to reposition during the work cycle. Replacing the steering wheel in favor of joystick steering provides additional legroom and a clear view of the working area.